Senate President Mitch Carmichael, R-Jackson, takes to the Senate floor to defend his last-dollar-in community and technical college bill and speak against two amendments. 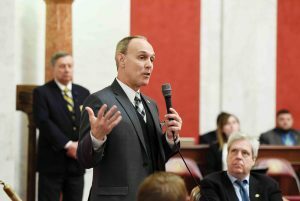 CHARLESTON, W.Va. — Debate on amendments to the Senate president’s last-dollar-in community and technical college program turned heated, becoming the first issue dividing Senate Republicans and Democrats. SB 1, sponsored by Senate President Mitch Carmichael, R-Jackson, increases access of high school students and adults to community and technical college education for specific fields deemed necessary by the state Department of Commerce. It would create a “last-dollar-in”program to cover the remaining costs of attending the two-year schools once other grants and financial aid packages are exhausted.